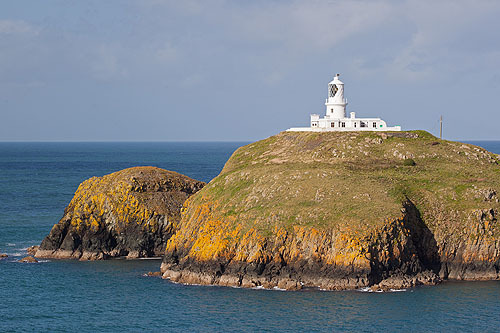 Ynys Meicel with Strumble Lighthouse perched on top. Showing the coloured bands / the Biological Zones where the changing water levels determine the life forms that can survive there. Grey band - Barnacles / Limpets. The Black Band (In the Splash Zone) - Black Tar Lichen -" Verrucaria Maura " . The yellow , orange , grey Band (Splash Zone) - Lichens growing on the area not covered by the Sea .